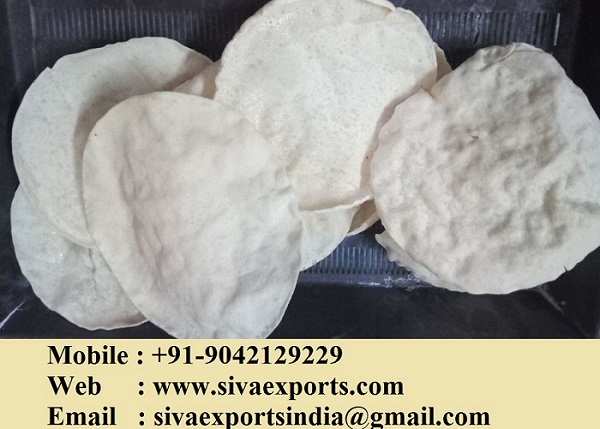 Siva Exports is one of the best Appalam Papad Manufacturers in India Tamilnadu Madurai. We are manufacturing Export quality appalam papad and supplying all over India as well as abroad countries too. Siva Exports is the most trusted Manufacturers of papad engaged in making healthy and tasty papads since its establishment in the year “1986”. Being a forerunning firm, we are more focused to keep the authentic taste in our offered wide range of appalam papads. Furthermore, to augment our brand image, we make sure to produce and pack our products in hygienic environment and dispatch the batch after conducting rigorous quality tests. We are enlist among the successful Suppliers of Udad Papad . The papad we make available is prepared in neat and hygienic conditions. We offer the papad in food-grade packaging options. We have all the in-house facilities to deliver bulk orders of it within the promised span of time owing to our excellent logistics network. Buyers can obtain the Papad at competitive rates from us. Customers can avail from us superior quality Appalam Papad which is manufacture from optimum grade ingredients. Since Our offered Papad is a traditional south indian food and is usually take with the meal as a side dish. These crispy papads are mostly relish during functions, cocktail hours and parties and prefer by the people of all age groups. We provide this range in moisture proof packagings to retain the freshness and taste for long time. We are widely acclaim for offering fresh and Crispy Papad to our clients. Our range of Plain Papad is make from various ingredients like cumin, chilies and many more that not only make Papad tasty but also give it digestive properties. Our Plain Papad is highly demand by our clients due to its amazing taste. We also provide Plain Papad in bulk at the best price in the market. With sincere intension to preserve our goodwill in the market, we offer best Papad at lowest rates.